Most of NSW silver production occurs as a by-product of the mining of other metals, particularly the base metals lead and zinc. NSW produced over 128 tonnes of silver in 2015–16, valued at over $95 million. The discovery of rich sources of silver at Broken Hill in 1883 became a foundation on Australia's on going status as one of the world's top producers. Silver exists as a native mineral although it is more commonly found in association with other minerals such as lead, zinc and copper metals ores, as well as gold. Silver is historically an important investment metal and key constituent in jewellery. 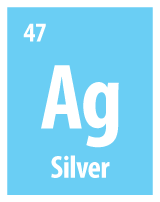 Of all metals, pure silver has the whitest colour, the highest optical reflectivity and the highest thermal and electrical conductivity as well as being ductile and malleable. These properties provide may provide uses in industrial applications like mirrors, electrical and electronic products. The silver mines of the future are being discovered in other parts of Australia as close as 10 metres below the surface and similar opportunities await investors in NSW. Excellent opportunities exist for the discovery of new deposits and for the development of existing resources. Read more about Silver [2.55 MB] mineralogy and prospectivity in NSW.